user friendly lever located below the seat. Available in four colours. Seating Height: 15 to 20"
Our company is among the most sought after offering Leather Office Chair to the clients. This product is designed using premium quality raw material and latest designing techniques as per the latest market demands. Offered range is widely demanded in offices for its optimum quality, fine finishing and high comfort level. Being a well-distinguished company in the market, we are involved into offering Office Chair. 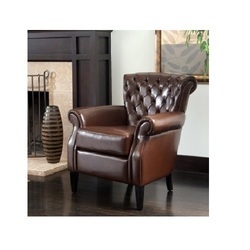 Matching up with the ever increasing requirements of the customers, our company is involved in offering Medium Back Leather Chair. In order to keep pace with the never ending demands of customers, we are involved into offering wide range of Leather Chair.